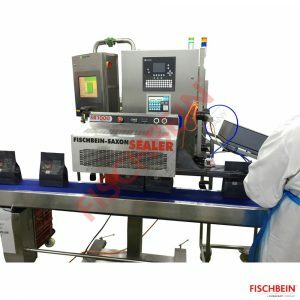 The Saxon Radiant SR 1000 is an industrial continuous sealer with a pair of radiant heater bars using the principle of heat transfer by radiation: the heat is radiated from the heater bars to the bag top and penetrates through the outer layer to the inner liner. Pressure wheels compress the two heated inner portions of the bag together to form a permanent airtight seal. The types of bags that can be closed with the SR1000 are: paper bags with a PE coating or with a PE inner liner, PE bags with a header card or foil bags.